To make pretzel dough: Combine water, sugar and yeast in bowl of a stand mixer and mix with dough hook until combined. Let sit for 5 minutes. Add butter, salt and 4 1/2 cups flour to mixture and mix on low speed until combined. Increase speed to medium and continue kneading until dough is smooth and begins to pull away from sides of bowl, about 3 to 4 minutes. If dough appears too wet, add additional flour, 1 tablespoon at a time. 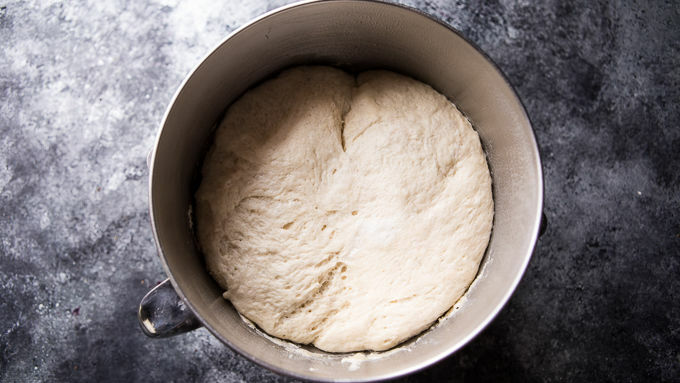 Remove dough from bowl, place on a flat surface and knead into a ball with your hands. Coat a large bowl with oil or cooking spray, add dough to bowl and turn to coat it with oil. Cover with plastic wrap and place in a warm spot until dough doubles in size. This will take about an hour. Remove dough from bowl and place on a flat surface. Divide dough into 18-20 equal pieces. Roll each piece into a 5-inch long rope. 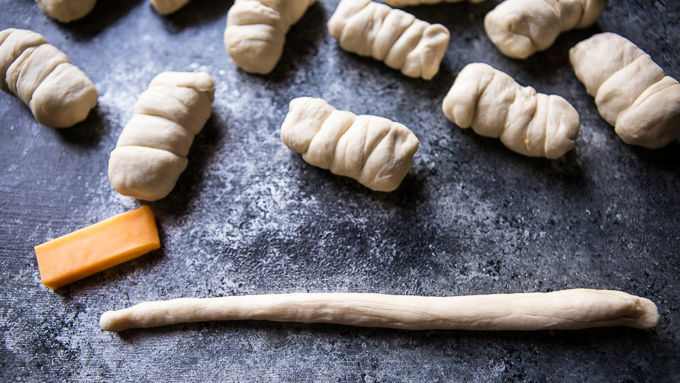 Coil dough around cheese stick half, sealing dough at both ends so the cheese is enclosed. Repeat with remaining dough. Next, bring water to a boil in a large pot. Once boiling, carefully add the baking soda. Boil pretzels in the water solution, a few at a time, for 30 seconds, splashing the tops with warmed water using a spoon. Remove with a large flat slotted spatula or a spider utensil. 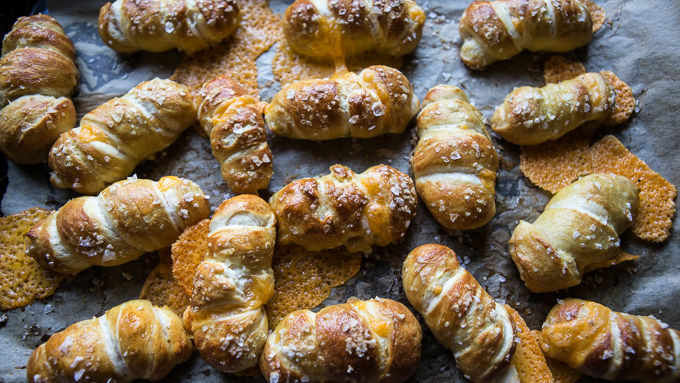 Place pretzels on a baking sheet, brush tops with egg wash and season liberally with sea salt. Bake for 15 to 18 minutes or until pretzels are golden brown. Enjoy warm! Try using mozzarella cheese sticks and dipping the pretzels in pizza sauce for a pizza version! You can also replace the cheese with mini hot dogs and wrap the dog in cheese slices. Then just wrap the hot dog and cheese in the pretzel dough! Happy New Year, everyone! I’m hoping you all had a great Christmas and a super fun New Year’s! I know I did. We had all of our family in town and the house was PACKED. The kitchen was crammed… pretty much the whole time. It seemed like there was always someone who was hungry! Man, I made A LOT of food. I quickly needed some good appetizers and snacks and figured: What could be better than cheesy pretzel nuggets? My brother loves Auntie Anne’s™ Cheddar Stuffed Pretzel Nuggets and suggested that I try to replicate them. I thought that was a great idea, that they would be ideal for people to munch on—and hopefully hold them over until the next meal. I used my go-to pretzel dough recipe and basically just stuffed some good ole cheddar cheese inside. It’s really the simplest concept, but these are SO GOOD. Like addicting good. Stopping at just one is essentially impossible. These are also easy to modify! Try using mozzarella cheese sticks and dipping the pretzels in pizza sauce for a pizza version! You can also replace the cheese with mini hot dogs and wrap the dog in cheese slices. Then just wrap the hot dog and cheese in the pretzel dough! Now that the holidays have passed, I’m gearing up for the Big Game and obviously these would be PERFECT. 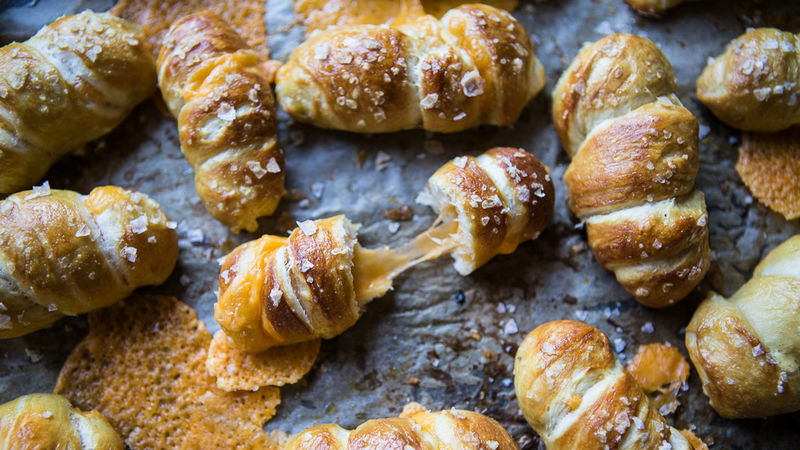 I mean, pretzels + cheese?? YES. Enjoy warm! You could also serve these with Buffalo sauce, ranch or mustard. And of course, they’re great plain too!